bNeurology (P.D.M. ), Henry Ford Hospital, Detroit, Michigan. SUMMARY: Autoimmune encephalitis is a relatively new category of immune-mediated disease involving the central nervous system that demonstrates a widely variable spectrum of clinical presentations, ranging from the relatively mild or insidious onset of cognitive impairment to more complex forms of encephalopathy with refractory seizure. Due to its diverse clinical features, which can mimic a variety of other pathologic processes, autoimmune encephalitis presents a diagnostic challenge to clinicians. Imaging findings in patients with these disorders can also be quite variable, but recognizing characteristic findings within limbic structures suggestive of autoimmune encephalitis can be a key step in alerting clinicians to the potential diagnosis and ensuring a prompt and appropriate clinical work-up. 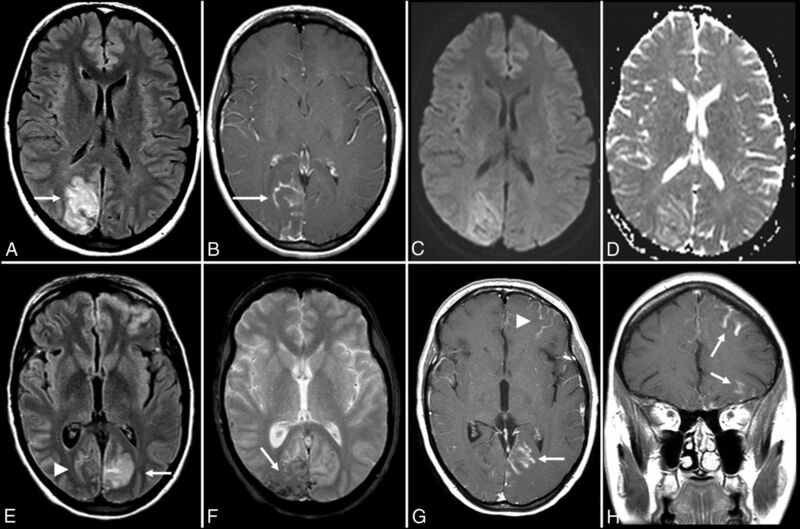 In this article, we review antibody-mediated encephalitis and its various subtypes with a specific emphasis on the role of neuroimaging in the diagnostic work-up. 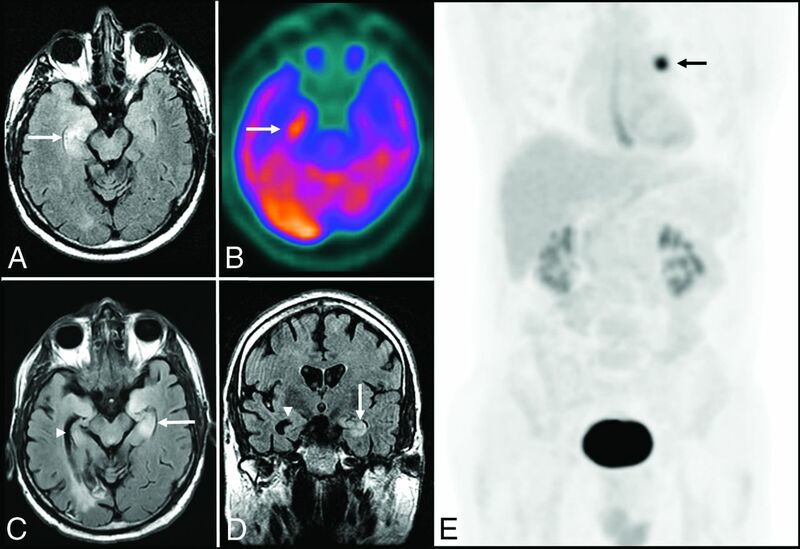 The purpose of this article is to discuss the subset of immune-mediated CNS conditions with features of autoimmune encephalitis (ie, antibody-mediated inflammation of the brain), provide a framework for radiologists to understand the relevant neuroimmunology, review the major antibody subtypes, and describe the constellation of clinical and imaging features that are most suggestive of this diagnosis. Regardless of the etiology and antibody profile, there is a clear predilection in autoimmune encephalitis for antigens within the limbic system (Figs 1 and 2).3,10,23,24 Paraneoplastic limbic encephalitis, a specific paraneoplastic syndrome affecting the temporal lobe and limbic structures, was first described by the British neuropathologists Corsellis et al25 in 1968 after identifying postinflammatory changes in the mesial temporal lobes of patients with progressive memory loss after being diagnosed with lung cancer. Kohler et al26 later correlated these inflammatory changes with T2-weighted hyperintense signal changes on MR imaging of the brain. These characteristic neuroimaging findings were later validated by a larger study of 50 patients with paraneoplastic limbic encephalitis across different antibody profiles that found that 39 of 50 patients (79%) had similar T2-FLAIR hyperintense signal changes in their temporal lobes and limbic structures.19 This study, conducted by Gultekin et al19 in 2000, proposed the first diagnostic criteria for paraneoplastic limbic encephalitis, which included the following: 1) short-term memory loss, seizures, or psychiatric symptoms; 2) <4 years between symptom onset and cancer diagnosis; 3) exclusion of metastases, infection, metabolic, or other causes; and 4) one of the following: inflammatory CSF findings, temporal lobe T2 or FLAIR hyperintensity on MR imaging, or electroencephalogram abnormality in the temporal lobes.19 Tüzün and Dalmau27 subsequently modified these criteria in 2007 to account for the growing subset of nonparaneoplastic forms of autoimmune encephalitis, which also demonstrated prominent limbic involvement. Anti-Hu encephalitis. A 68-year-old man with chronic obstructive pulmonary disease presented with gradually worsening memory deficits and confusion, with subclinical seizures. MR imaging of the brain demonstrates T2-FLAIR hyperintensity and mild expansion in the right medial temporal lobe (A), right insular cortex (not shown), and left dorsal thalamus (not shown), without restricted diffusion (not shown) or postcontrast enhancement (not shown). FDG-PET of the brain demonstrates a hypermetabolic focus within the right medial temporal lobe lesion (B). PET of the body demonstrates a hypermetabolic focus in the left lung (E), consistent with biopsy-proved small-cell lung cancer. The patient was in remission following treatment with intravenous immunoglobulin infusions, oral steroids, and chemotherapy, but he presented approximately 2.5 years later with worsening memory decline. MR imaging at that time (C and D) shows new T2-FLAIR hyperintensity in the left medial temporal lobe (white arrow) with volume loss within the right medial temporal lobe (white arrowhead). An old right occipital lobe infarct is also incidentally noted. Graves ophthalmopathy with anti-Hu encephalitis. 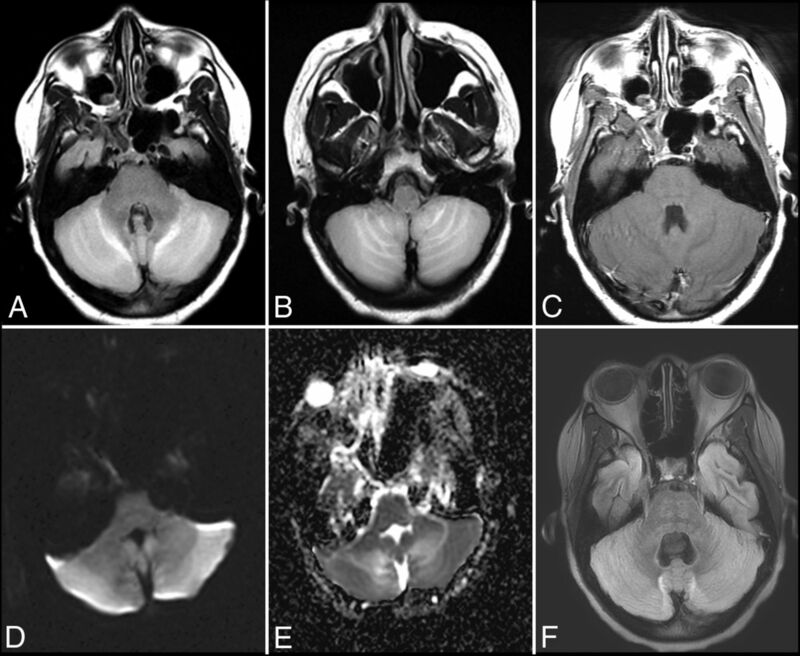 A 63-year-old woman with severe encephalopathy and diffuse enlargement of the extraocular muscles developed fatal autonomic dysfunction. MR imaging of the brain demonstrates prominent T2-FLAIR abnormalities in the mesial temporal lobes (A), right thalamus (B), right > left insular cortex (B), and posterior right temporal lobe (B), without enhancement (C) and with T2 shinethrough but no restricted diffusion on DWI (D) and the corresponding ADC map (E). There is also diffuse symmetric enlargement of the extraocular muscles, resulting in exophthalmos (F). Anti-CV2 (collapsin response mediator protein 5) encephalitis is a unique subtype associated with small-cell lung cancer and malignant thymoma that has prominent T2-FLAIR hyperintense lesions in the striatum and clinically resembles choreiform movement disorders.3,37 MR imaging features are also atypical compared with other types of autoimmune encephalitis in that there is less prominent involvement of the medial temporal lobe.3,37 Most important, there is typically no restricted diffusion or T2-FLAIR hyperintense lesions in the striatum, which can help differentiate this condition from prion diseases like Creutzfeldt-Jakob disease.3,16 When one considers this relatively rare diagnosis, it is important to first rule out more common toxometabolic disorders such as hyperammonemia, carbon monoxide poisoning, and hypoglycemia. Anti-glutamic acid decarboxylase encephalitis. A 61-year-old woman presented with headaches, mild confusion, and nystagmus without development of psychosis, severe encephalopathy, or seizures. MR imaging of the brain demonstrates T2-FLAIR hyperintensity in the right > left hippocampus (A and B), right > left insular cortex (B), and bilateral cingulate gyrus (C and D) without restricted diffusion (not shown), hemorrhage (not shown), or postcontrast enhancement (not shown). Anti-N-methyl D-aspartate receptor encephalitis. A 32-year-old woman presented with headaches, vertigo, and psychosis with subsequent development of encephalopathy and seizures. 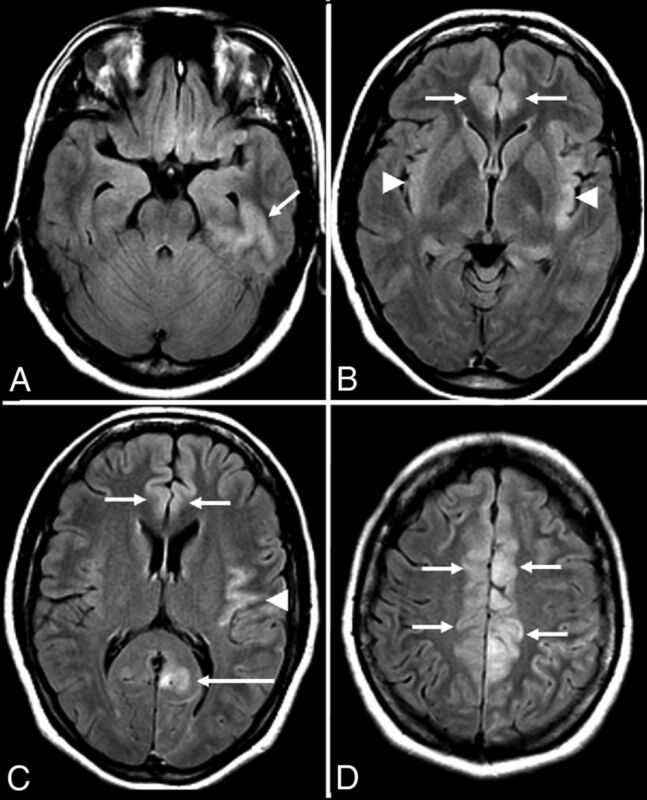 MR imaging of the brain performed after the onset of seizures 2 weeks after initial presentation demonstrates T2-FLAIR hyperintensity in the left inferior temporal lobe (A), left > right insular cortex (B and C), and left > right cingulate gyrus (B–D), without restricted diffusion (not shown), hemorrhage (not shown), or postcontrast enhancement (not shown). 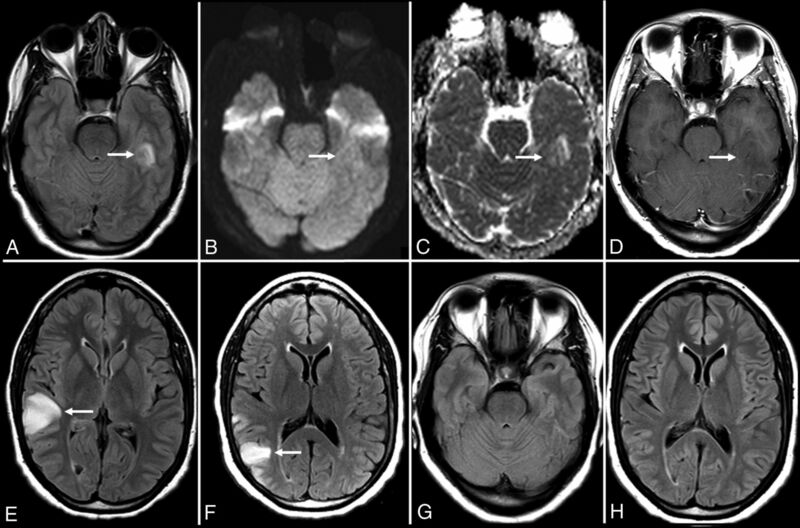 With early diagnosis and treatment, patients with NMDAr encephalitis have a relatively good prognosis and can experience a return to their baseline functional status with complete resolution of neuroimaging abnormalities on follow-up examinations.20,41,49 Relapsing forms of nonparaneoplastic NMDAr encephalitis have been reported, and long-term prophylaxis with steroid-sparing agents like rituximab may be required in a subset of cases.42,48,50 A minority of cases of NMDAr encephalitis can be associated with an underlying malignancy, especially in older patients.20,52,53 According to 1 study, 45% of adult women with NMDAr encephalitis had an underlying ovarian teratoma but only 9% of young girls had this finding.53 In women older than 45 years of age, this same study found that 23% of women had an ovarian carcinoma instead of a teratoma.53 This finding highlights the need to screen all patients with autoimmune encephalitis for an underlying malignancy, regardless of the antibody profile, and even to consider the possibility of a contralateral or concurrent tumor with a poor response to treatment despite removal of a tumor.27,49 NMDAr encephalitis is an especially important diagnosis to consider in young patients with limbic encephalitis because the California Encephalitis Project found that the number of young patients in the study with NMDAr encephalitis was greater than those with any single viral etiology.54 Anti-NMDAr antibodies have even been found in patients with herpes simplex virus encephalitis55 and Rasmussen encephalitis,56 which can further complicate the diagnostic work-up. Anti-voltage-gated calcium channel encephalitis. 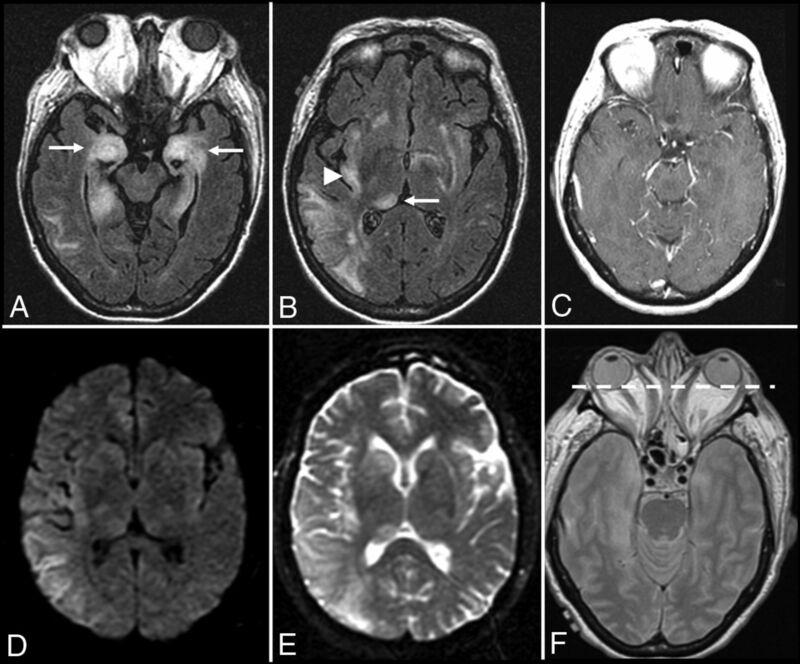 A 39-year-old woman presented with left-sided weakness and left visual field deficits with subsequent development of encephalopathy and seizures. 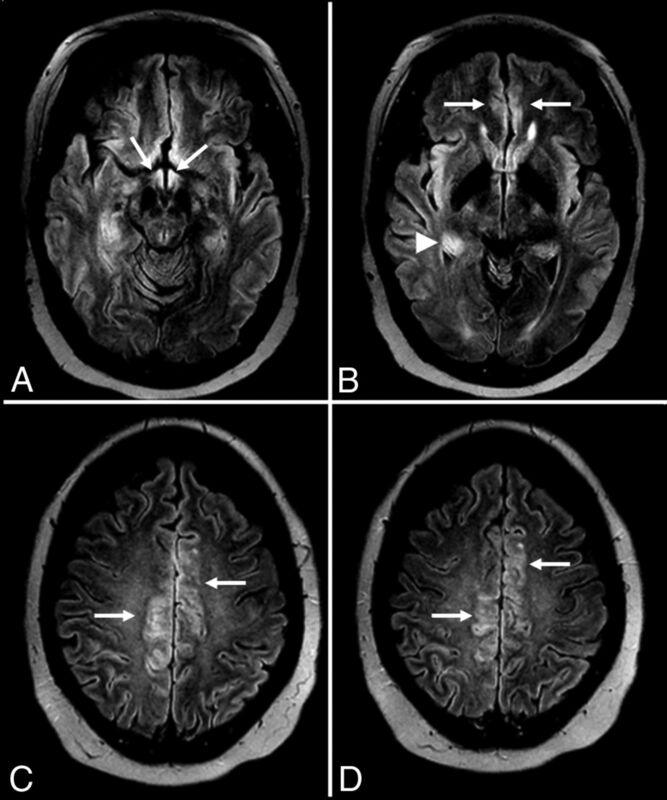 Initial MR imaging of the brain (A–D) demonstrates multifocal T2-FLAIR hyperintense lesions in the right parieto-occipital region (A), with associated pial/sulcal enhancement (B) and mild cortical restricted diffusion and T2 shinethrough within the subcortical white matter on DWI (C) and the corresponding ADC map (D). Follow-up MR imaging of the brain performed 34 days later (E–H) demonstrates decreased T2-FLAIR hyperintensity (E) with cortical laminar necrosis and petechial hemorrhage (F) at the original lesion, with progressive development on subsequent examinations of similar cortical lesions in the contralateral frontal, parietal, and occipital lobes (E–H). Anti-voltage-gated calcium channel cerebellitis. A 23-year-old woman with a history of autoimmune hepatitis presented with altered mental status. Initial brain MR imaging (A–E) demonstrates T2-FLAIR hyperintensity within the bilateral cerebellar hemispheres with mass effect on the fourth ventricle (A and B), without evidence of postcontrast enhancement (C) and with mild restricted diffusion on DWI (D) and the corresponding ADC map (E). A follow-up scan 1 month later (F) demonstrates resolution of the T2-FLAIR hyperintensity and associated mass effect on the fourth ventricle following a steroid taper. Hashimoto encephalitis. A 41-year-old woman presented with gradually worsening headaches and memory impairment without the development of psychosis or seizures. MR imaging of the brain (time, 0) demonstrates T2-FLAIR hyperintensity in the inferior left temporal lobe (A) without evidence of restricted diffusion (B and C). MR imaging of the brain (time, 21 days) demonstrates enlargement of the lesion on T2-FLAIR (not shown) without postcontrast enhancement (D). MR imaging of the brain (time, 3 months) demonstrates resolution of the prior lesion (not shown) but development of similar T2-FLAIR hyperintensity in the right frontoparietal junction (E). A subsequent scan at approximately 5 months shows near-complete resolution of that lesion with a new T2-FLAIR hyperintense lesion more posteriorly (F). A follow-up scan (G and H) nearly 1 year from onset shows complete resolution of the imaging abnormalities. Autoimmune encephalitis is an important diagnostic consideration in patients presenting with new onset of altered mental status of unclear etiology. It includes a myriad of clinical conditions that have a common pathophysiology (ie, antibodies directed against CNS structures). The 2 distinct groups (group I, intracellular directed antibodies, and group II, cell-surface directed antibodies) have overlapping clinical and imaging features. Neuroimaging findings will most often involve the limbic structures, but involvement of the striatum, diencephalon, or rhombencephalon can be seen. A subset of patients with autoimmune encephalitis will have no neuroimaging findings despite profound neuropsychiatric dysfunction, but serum antibody testing can still ultimately lead to the diagnosis of autoimmune encephalitis. While there is no single diagnostic feature that can make this diagnosis in isolation, recognizing a certain constellation of findings during the work-up of complex and atypical cases of new-onset altered mental status is crucial to confirm the diagnosis with serologic testing and initiate treatment in a timely fashion. We are grateful to our clinical colleagues in the Department of Neurology within the Henry Ford Health System for their role in diagnosing and treating patients with autoimmune encephalitis at our institution. We would specifically like to acknowledge Dr Daniel Newman, Director of the Henry Ford Hoenselaar ALS Clinic, for his enthusiastic clinical support and expertise. We would also like to thank Dr Chunhai Hao, Chief of Neuropathology in the Department of Pathology and Laboratory Medicine at Henry Ford Hospital, for his work characterizing the histopathology of brain biopsy specimens in cases of suspected autoimmune encephalitis at our institution. Paper previously presented, in part, at: Annual Meeting of the American Society of Neuroradiology and the Foundation of the ASNR Symposium, May 23–26, 2016; Washington, DC.